full colour throughout. Issues 24 and 25 now available in this new, exciting format. Currently on issue 25, the magazine has grown from strength to strength, being read by SAM users in over 22 countries. The launch issue, 44 pages in size, and is full of articles, programs, news, reviews, tips, hacking and more. with compiled sprites, and also an in depth look at realistic surround sound. contributed articles from Adrian Brown, including adding Atom support into Comet Assembler. Another packed issue of SAM Revival! In this issue is my own feature article entitled 'SAM In A Can'. article so I will say no more - check it out in the magazine! in 1990-91. Another article looks at the improvements in the latest version of B-DOS. from the game, and Wolfgang Haller returns with another B-DOS article. and gives them a big overhaul before patching them into the game level editor from the previous issue. using B-DOS and a CD-ROM drive on the SAM. hints and tips, and SAM Snippets. Inside this issue it starts off with a roundup of news from the ORSAM show, and other SAM going ons. CF Interface and Atom, as well as a detailed look inside the 'SAM In A Can' I made for David. look at the Voicebox from Blue Alpha Electronics which was briefly on sale from 1990 to 1991.
at the more modern versions of the hard drive DOS. Quazar News, as well as the SAM Scene Roundup, listing news and events from around the SAM world. There's also some reviews and a sprinkling of the ever popular SAM Snippets! Zilog which I discovered after replacing a Z80 in a SAM Coupé. Onto the accompanying cover disk - the first ever SAM Revival cover disk features two great games. bits so it can play through the soundchip in the SAM, as well as improving all the graphics. SAM Scene Roundup and SAM Snippets! behind the scenes of his past releases. Simon Owen has taken things further - by writing an emulator to emulate the PacMan Arcade Machine! technical look at the in's and out's of the emulator. On the accompanying coverdisk is an exclusive game, called 'Invasion II' which was written by Warren Lee. to detail with all the animation and scenery, as well as a fully animated introduction. will show you just what SAM Coupe can do sonically! 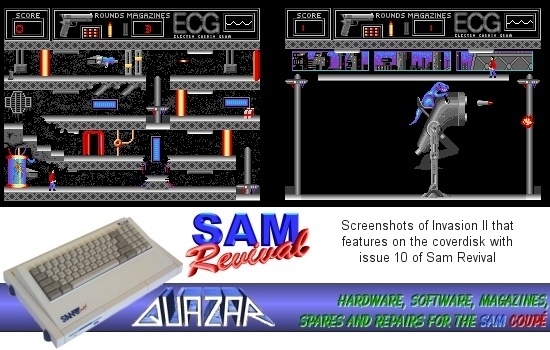 This issue of SAM Revival features an 8 page news section, catching up with what's happening in the SAM scene. speed of the SAM to that when using the Mayhem Accelerator prototypes. also features additional sound effects if you have a Quazar Surround soundcard for your SAM Coupe. a machine code routine for palette changes using line interrupts which is answered with a few pages of source code! to from Hydrasoft earlier in the year. "A genetically engineered biological organism has just been created for genetic correction experiments. and websites from the SAM Scene. the possibilities of new emulators for the SAM with the speed of the Mayhem. The coverdisk with this issue features the classic SAM adventure game 'Days of Sorcery' by Nigel Kettlewell. news of a SAM article I wrote for the launch issue 'Retro Fusion' - see an earlier news item on this page for details. include the Coupe Correspondense letters page and the SAM Snippets! The coverdisk with this issue features the classic SAM adventure game 'Legend of Eshan' by John Eyre. for the Quazar Surround soundcard if you have one. new combined news section, letters pages and SAM Snippets. screenshots from the near finished version of the game which make good use of the colour printing in the magazine. working on. This issue see's the diary from Johan Koelman about his work so far on a Gameboy emulator for the SAM. that an old ZX Spectrum game programmer may be looking to develop on the SAM sometime this year. Issue 18 is quite a packed issue! More pages than the previous few issues, and a jam packed coverdisk! Let's kick off with what's on the disk. First up are the three brand new emulators from Simon Owen. while the Orao is a 6502 based Croation system so that's using Simon's latest 6502 CPU emulator core. 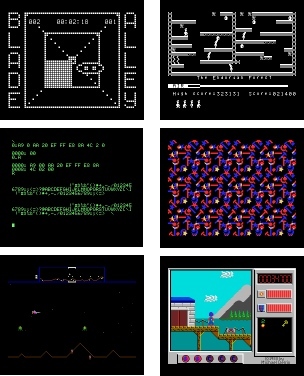 off his hat trick Simon has also released an Apple 1 emulator too! effect from the Amiga and includes the source code. screenshots of ISAAC - the port of Rebelstar that's being developed by Stuart Brady and Warren Lee. compulsory sprinkling of SAM Snippets with bits of trivia from the SAM world. had a limited release from Zedd-Soft, and now for the SAM Revival coverdisk it's had a graphical overhaul. trying to do the same. games and emulators that are currently being written for our favourite blue footed computer! chance to take a gentle plunge into learning Z80 assembly and you'll soon see it's nothing to be scared of! quite a surprise to see on the SAM. emulator code and other enhancements including support for NTSC and 100Hz .SID tunes and larger file sizes. Warren Lee, which looks great so far. of his work on porting CPC/IP to give the SAM it's first suite of internet enabled programs. deal fell through so it was never released. articles include an interview from Frode Tennebo where he interviews David Gommeren and Rob Mies of The Lords. solid 3D engine on the SAM. source code and executable for the Trinity patched version of B-DOS. wireframe 3D demo from Thomas Harte who is looking to produce a full 3D engine for the SAM Coupe. 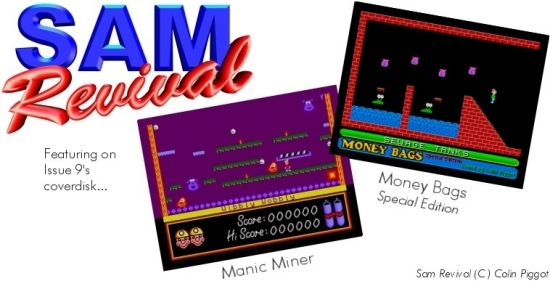 Feature articles include a look at what happened to the proposed sequel of Manic Miner on the SAM. second article from Thomas Harte who is developing a 3D engine for the SAM. 3D demo from Thomas Harte, and a full adventure game from Hydrasoft / Pete King. source code for the new patched SAM ROM to auto boot from the Trinity. about the point-and-click adventure game he was developing back in 1992. Emulator (Simon Owen), Wubtris + more (Rob Evans). the fab cover artwork for the magazine too!) There's also the preview demo 'Minutes Before The Witching Hour'. it available as a professional full colour book you've no excuse to not pick up a copy. the robot and has came up trumps with the drawing for the cover. of projects that are being worked on. transfer data from a PC to the SAM via the Trinity Ethernet Interface. a look at some of the rarer and more unique items I've collected over the years for the SAM Coupe. 56 page issue of the magazine. And now the full colour print really adds a lot more depth to the contents. 'MobyDX' from Black Jet - a new release especially for SAM's anniversary - thanks guys! David Sanders and Howard Price. and great music! Plus one of the scrollers does mention something about a hidden part... Hmmmm!